Development too near and too far? This article examines Oxford’s flood history, and considers its relevance to the many flood plain proposals before the Council and asks whether current proposals such as Barton West, Oxpens, West Area AAP, Westgate and the 9 bedroom development on Fiddler’s Stream among others represent developments too far, yet too near to the water. Oxford has been visited repeatedly by severe flood events which swamped entire suburbs and vast swathes of the surrounding countryside. Flooding is regular, is very much part of the ecology of the Thames , and highly unpredictable in effect for a given area due to Oxfordshire’s gentle topology – the events can be very sudden and intense, and impact a given area only. The Local Lead Flood Authority (Oxfordshire County Council) admits its knowledge of flood risk, in particular that of surface and groundwater , is remarkably poor, consisting of a study based on partial evidence exclusively from the 2007 flood event, with no analysis and little awareness of the history described here. 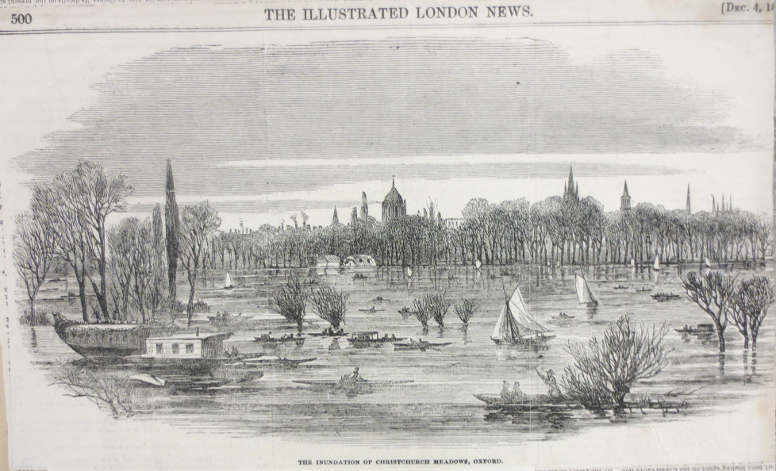 Flood events in the Thames have occurred approximately 4-5 times a century since records began – this article concentrates on those of the nineteenth century. The intention of this is article is to increase awareness, and more importantly analysis of, historical flood events due to the current dangerous reliance on computer modelling. Oxford is near the confluence of the Thames, Cherwell, the Ray, Windrush and Bayswater Brook, (at the Barton development site) part of one of the greatest catchment areas in Britain, rain falling anywhere upstream in this vast area can create a flood event in Oxford. The Thames and Bayswater Brook flow very approximately north, before the Thames turns south, which causes a loss of flow energy. Thus, there is a large, flat basin centred at Port Meadow which fills in time of flood, discharging through a gullet at Oxford and Kennington. The exquisitely named Reverend Clutterbuck of Long Wittenham, a leading light in the Thames Conservatory, made height observations “above the high navigation mark” which are listed after each flood in the reference section for comparison purposes. A number of deaths occurred due to boating and coaching accidents or infirmity. Detailed accounts of each flood from newspapers are given in appendix 1, but would be repetitive. However certain common themes stand out. 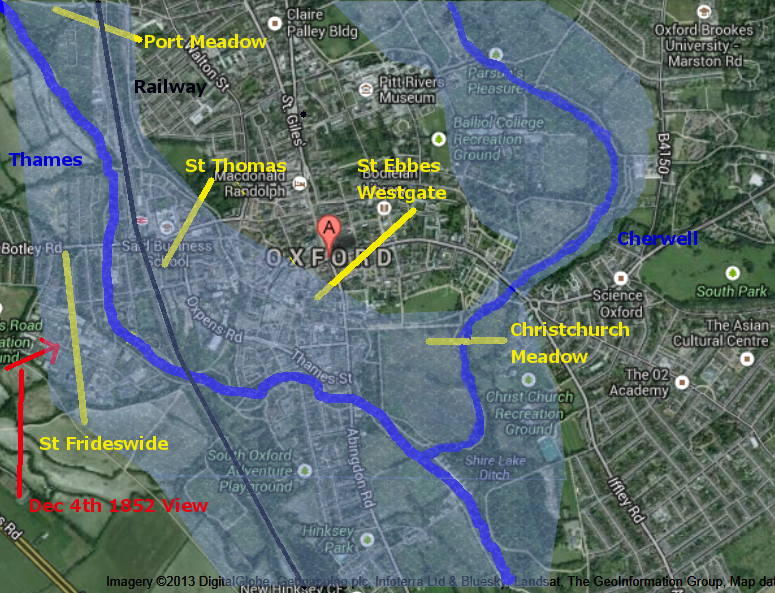 St Ebbes, St Thomas’s, St Frideswide’s, Jericho, Osney, Botley Road, the railway station, Abingdon Road, Cold Harbour and Hinksey are frequently flooded, and of course, Port and Christchurch Meadows with Old Marston often cut off. Parts or all the residential areas listed are in at least 1:1000 year flood risk zone 2 as defined by the Environment Agency. The railway, although lower than today, was frequently flooded, with damage both to the line and the tunnel at Wolvercote. The Environment Agency has traditionally concentrated on flooding from rivers, and less so on risk from ground water and surface water. The British Geological Survey has categorised most of Oxford, including the Barton site in the highest category of susceptibility to groundwater flooding hazard. Surface water is defined as water that flows over the land before arriving in a water course. The limitations of the preliminary report are acknowledged, and include no analysis whatever of the actual historical realities of Oxford’s flooding, relying instead on computer modelling. Further, the subsequent flood of 2012 could not be included. The map of Oxford even as late as the first OS map of 1876 shows little building outside of central Oxford and traditional villages such as Headington and Marston – the water holding fields are all gone, leading to more rapid runoff. The conclusion must be that input into river systems will now be much faster, as will their drainage, the risk therefore is not lower, but changed – we are more vulnerable to flash flood events occasioned by very heavy rain over short periods, and less vulnerable to prolonged wet periods, at least in isolation. The most dangerous juxtaposition for Oxford would be therefore heavy rain in the catchment area, followed by heavy rain directly in the local area. The very substantial flooding in the last half of the nineteenth century could be related to the ice melt occurring at the end of the mini ice age which lasted approximately 1350 – 1850 [Fagan] ,which was, in effect, a global warming event – a situation not unlike the current period. All these developments are located on, or very close to, land for which many flood records exist, improvements in drainage, most of which had already occurred before the 1894 flood, may be cancelled out by the negatives listed above. The Barton development is on the Bayswater Brook flood meadow or “Headington Meade” as marked on most historical maps. The site is 62m above sea level at its lowest, with proposed development at slightly higher levels. The site has mostly impermeable rock or thick clay underneath and is normally very damp and marshy. It has high groundwater levels as shown by The PFRA 4, Map 7, “Groundwater Flooding” which identifies the 1 km square in which Barton West is in as having 25% – 50% of its area as susceptible, with much of the this square on higher ground. However it is not clear where these fields were. Mr Greaves had a very extant 475 acres in total. One observer calculated that 3”of rain in the 1894 flood was 73,000 gallons of water per acre – it seems hard to believe the intended Barton flood defence of holding tanks could possibly hold this amount of water. The site is in effect a source and destination for flood water, with SUDS systems proposed to prevent downstream flooding. The flooding to which the development is most susceptible is, as explained above, the least understood, and the most likely to change if climate models prove correct. There is incontrovertible evidence that severe flooding has occurred on, or very near to, many of the future building sites repeatedly, with the possible exception of Barton, possibly as it was not considered worthy of recording. 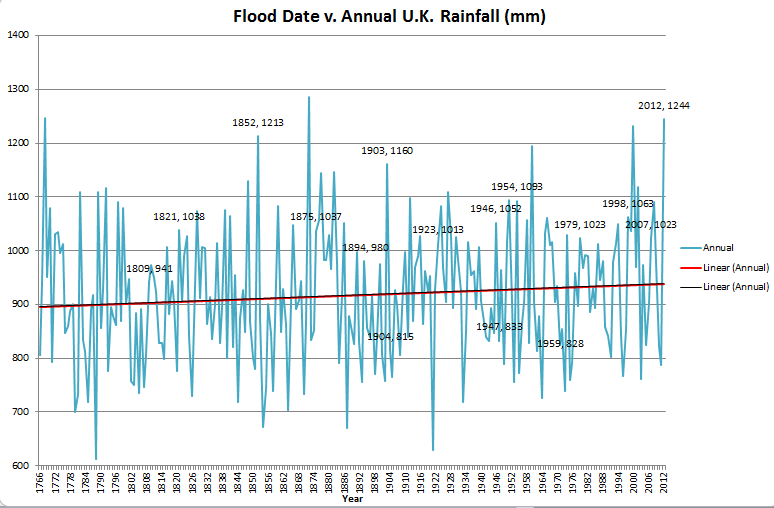 Either the Environment Agency’s 1:100 and 1:1000 floodlines have been exceeded so many times it will be millennia before flooding happens again, or the modelling is wrong, or that something has changed – and to an extent , it has. Drainage is improved, but in the Thames valley stiles go over long gone hedges, vast arable swathes above Barton replace the pocket sized fields Lord North’s Elsfield map of 1703, the sprawl of Headington is where Antony A Wood gathered ears of rye in 1682, fields exist where most of ancient Wychwood used to be. If the water comes, there will be little to slow it as nature’s SUDS systems are no longer exist. A bunch of blokes in “hi viz” manning flood defences at Osney may be a comforting visual metaphor for a caring patriarchal state, but those are river defences – when the water goes by, but there is little defence for groundwater which comes up from under, and surface water, that flows over, which is precisely the risk at Barton – we advance to the water, when we should retreat. Flood risk has not declined, but changed. Global warming, bringing heavier and more intense rainfall, and vegetation loss may mean vulnerability to flash flooding via ground and surface water has increased, whereas that of long term rainfall has declined – although actual flooding will normally be a combination of several factors. Recent flood events have surprised both with their frequency and extent many of which have exceeded the 1:100 and 1:1000 flood lines defined by the Environment Agency. What is most disturbing is, as admitted by the Local Lead Flood Authority, a very poor state of knowledge regarding flood risk coupled with an excessive reliance on computer modelling, and the almost complete absence of either awareness or analysis of past events by either the authorities or developers. The Thames has surprised again and again with the sheer magnitude of flooding events – it is now incumbent on these parties to prove that historical floods are no longer relevant and if so why not. 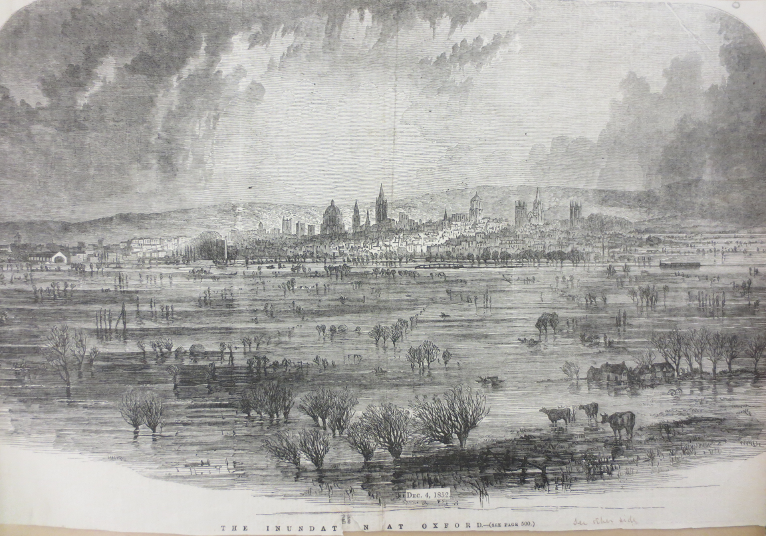 The Dec 4th 1852 vista of Oxford in flood appears to be extremely accurate in its representation of individual buildings, and was clearly drawn from the hills above Hinksey, however the building alignments appear impossible from any given angle. Possibly the artist combined various views to achieve the vista shown – by Dec 4th the floods had receded. The information presented here should be interpreted with a healthy degree of scepticism. Sources, particularly newspapers outside of Oxford, must not be considered reliable. All the material should be treated with caution both as it is based on partial information and the author has no qualifications whatever in the subject area. This article raises questions, but does not provide answers. Flood extents are based on place names mentioned in sources and some visual and photographic evidence – no detailed analysis of height has been undertaken. Permission to use images owned by Oxford University is very gratefully received. and searching with the terms “HenryTaunt flood” and images. 1. Clutterbuck JC, 1801-1885. The perennial and flood waters of the upper thames. London: London : Printed by William Clowes and Sons; 1864. 2. The floods, serious destruction of property. 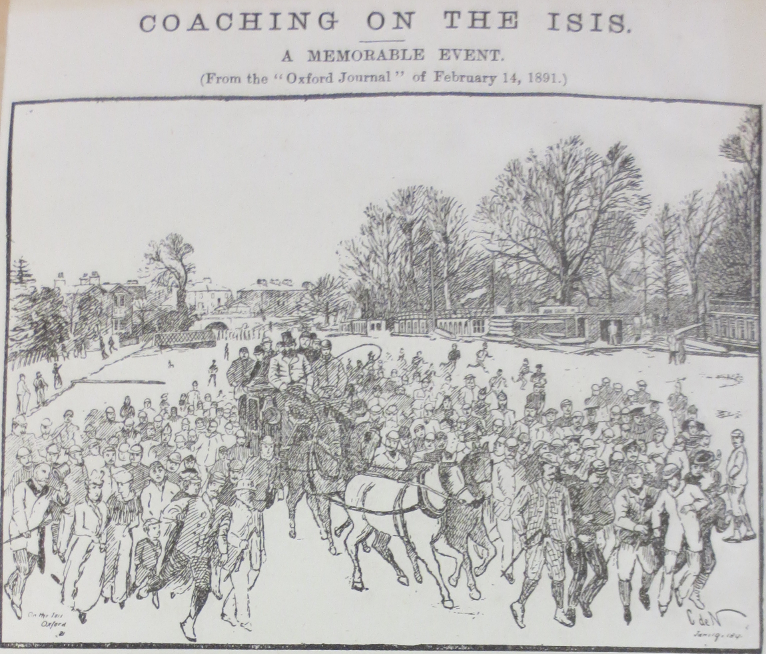 Oxford Chronicle. Nov 24 1894 1894:8. 3. England’s most dreadful calamity by the late floods electronic resource] : Being a most lamentable account of the great damages sustained by the fearful invndations, caused by the unparalell’d rain which fell on the 24th of april, 1682 : And the late rains which have lately hapned : Containing the several houses, barns, cattle, out-houses, stacks of hay and corn, being carried away : Together with the number of persons drowned, and of some thousands of acres of ground layed under water : Giving a relation of the particular damage sustained in the city of london, and the suburbs thereof, at branford, camberwell, dulwich, depford, on the river thames .. London? : London? : Printed for P. Brooksby ..; 1682. 4. Oxfordshire County Council. Preliminary flood risk assessment report final report<br />June 2011. . 2011;3. 5. WSP. NPPF FLOOD RISK ASSESSMENT land at barton, oxfordshire. . 2013. 6. Environment Agency. Flood event report – winter 2012/13 west thames area. . 2013. www.environment-agency.gov.uk. 7. Records of the past 1764. Jackson’s Oxford Journal. Dec 28 1895. 8. Jackson’s Oxford Journal. January 28, 1809 1809. 9. The weather. The Times. Dec 31, 1821 1821:3. 10. Inundations. The Times. Nov 17, 1852 1852. 11. Great floods at oxford. Jackson’s Oxford Journal. Nov 20th 1852 1852. 12. The inundations. The Times. Nov 27, 1852 1852:7. 13. The innundations. Bell’s Life. Nov 27th 1852 1852. 14. The floods. Daily Star. Nov 29th 1852 1852. 15. The floods – oxford. The Times. Dec 20th 1852 1852. 16. The inundations. The Times. Jul 16, 1853 1853. 17. The floods – latest details. The Standard. Jul 24, 1875 1875. 18. The great floods of 1852 and 1875. Jackson’s Oxford Journal. Nov 24th 1894 1894. 19. The floods – serious destruction of property. Oxford Chronicle. Nov 24th 1894 1894:8. 20. The floods. Jackson’s Oxford Journal. Nov 24th 1894 1894. On Jan 28th 1809, “the sudden thaw of a great accumulation of snow, accompanied by much rain, has produced in this neighbourhood a flood of greater extent and depth than has occurred here for the last thirty years. Several streets in the suburbs of the city have been inundated, particularly St Thomas’s parish, where water runs in torrent thro’ the streets, the inhabitants being obliged to remove to their upper apartments. The great Wellington flood swept the country in November and December 1852 so named due to his death on the 14 September 1852 and subsequent funeral on 18 November of the same year. 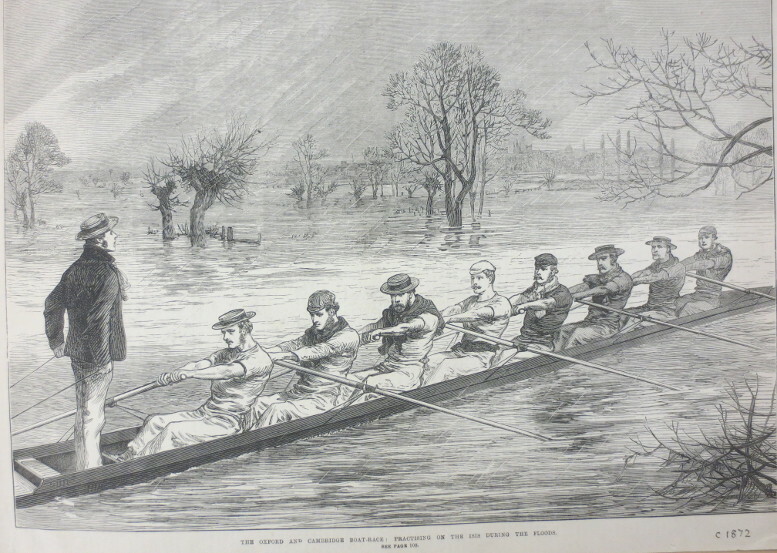 “The whole of the surrounding country is flooded – Oxford literally standing in a sea of water. The large meadow of Christ Church is covered with water, the Isis having overflowed its banks, and the river is even now continuing to rise, and there is great fear of the lower part of the college being flooded. From the force of the current a boat full of undergraduates was upset, and one of them, belonging to Jesus College, unfortunately drowned. The omnibus that runs from the railway station to the city yesterday attempted to pass under one of the arches of the railway-bridge [Hythe Bridge Street], when a large body of water suddenly came down from the neighbouring hills, encountering the vehicle in its course, breaking through the windows and doors and filling it entirely. Fortunately no passengers were inside, or they must have been drowned, as in a very short time the water so accumulated it was six feet deep under the arch, and spread for a long distance on all sides. Nov 24th – more rain and two feet on line, on Times Nov 27th “after a brief cessation, the heavens began again last night to pour down their torrents…so the floods are again rising… Thanks to the “gentle eminences” on which Oxford is situated, she is still able to hold her head above water, but if the present rate of rain continues much longer, she will soon be in greater difficulties. 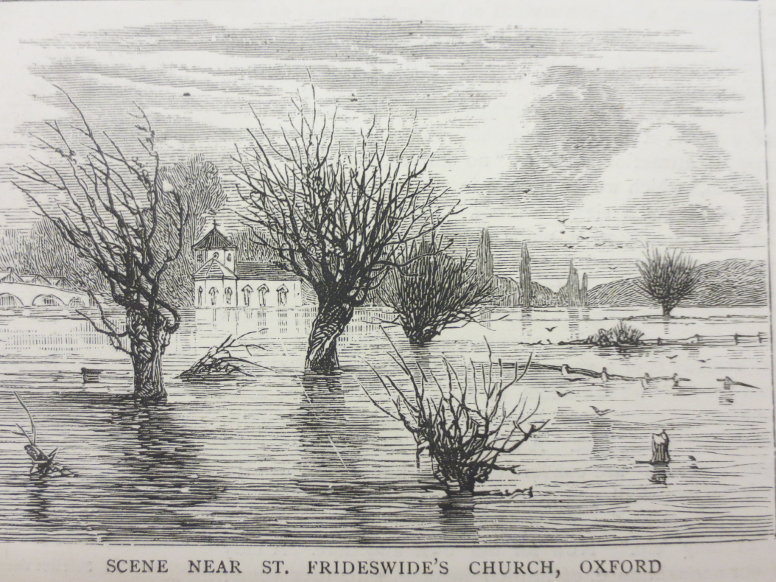 Times Dec 20th “although the floods have considerably abated from what they were some weeks ago,.. they cover the fields around Oxford…Cases of fever are reported to have occurred from low-lying houses near the river near the water, and attention to this cannot be too earnestly given. Jackson’s Oxford Journal, Nov 24th 1894, “– the volume of it, however, was so unusually large that in all the low-lying meadows, especialy those adjacent to the rivers, and in the basements and cellars of many houses it has by no means disappeared. In the streets in Osney, Friars, St Thomas’s and Hincksey [sic], the water made its way into hundreds of dwellings, .. four schools were closed by order of the managers during the height of the flood .. about midday on Friday the water was at its highest, and the discomfort and inconvenience it produced in the low-lying portions will not easily be effaced from the memory of the sufferers. In some cases children were taken to school in a boat.. and various articles being handed up to the bedroom windows in baskets it is estimated the planks would extend a distance of about three miles..
1894 : Clutterbuck : 4”-5” of rain 8 p.m. Nov 11 – 8 p.m. Nov 14th only 24 hours without rain. [3.3.1] The main data limitations from the perspective of the PFRA are with the recording of past flooding information. Prior to the Pitt Review (2008) there was uncertainty regarding responsibility for collecting data on local sources of flooding and little incentive for any party to collect such data. 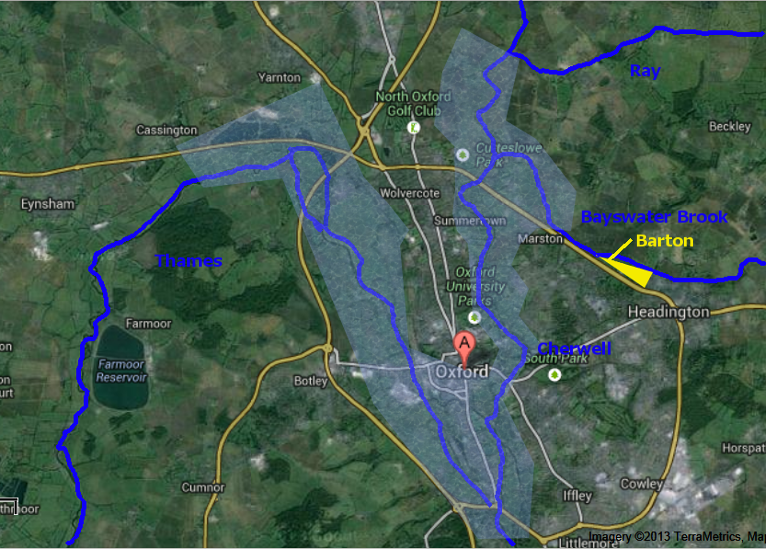 [5.1.2] There is little locally specific information on future flood risk for Oxfordshire. [5.2.3] It is important to note that the choice of the Flood Map for Surface Water as the “locally agreed surface water information” is solely made for the purposes of the PFRA and high level strategic work. More detailed flood risk studies should utilise the best available local information and carry out more detailed modelling as appropriate to the level of the study. [5.7.4] …. For example we understand rain storms may become more intense, even if we can‟t be sure about exactly where or when. By the 2080s, the latest UK climate projections (UKCIP09) are that there could be around three times as many days in winter with heavy rainfall (defined as more than 25mm in a day). It is plausible that the amount of rain in extreme storms (with a 1 in 5 annual chance, or rarer) could increase locally by 40%. [5.7.7] Wetter winters and more of this rain falling in wet spells may increase river flooding in both rural and heavily urbanised catchments. More intense rainfall causes more surface runoff, increasing localised flooding and erosion. [5.9.3] It is concluded that there are no major developments planned of the kind described in section 5.7.15 that would be expected to increase flood risk from local sources. [5.4.3] … However it is reasonable to say that large areas of the county [Oxford] are in the highest category of risk of groundwater emergence. Oxford, Flood, Flood History, Barton Development, West Barton, Oxford City Council, Oxford County Council, Westgate, Oxpens.